Last night we had one last visit with Darin and Kerry at Bj's Brewery on Oracle. We will see them again in November when we return. Take care and thanks for all your warm hospitality and visits. Our drive today (300 miles) via IH 10 and IH 8 to El Centro was not a fun drive for me as during the night I came down with a stomach virus that I think was passed from John who was ill earlier in the week. This has not been a good 6 weeks for us. 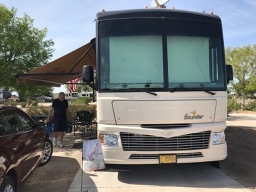 We arrived at El Centro Navy Air Facility RV Park around 400PM and I went straight to bed where I stayed until Late Saturday morning. Upon arrival the water heater John ordered was waiting for us for John to install during our stay here until the 9th. 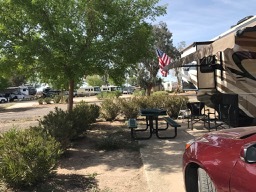 The base is small and the RV Park very nice with good sites, trees and foliage. A total of 106 sites in 3 different areas. 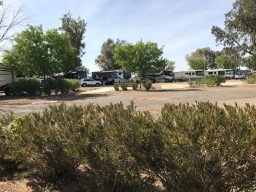 After passing all the mega RV parks in Yuma, glad we chose this one. Yuma is 60 miles east. Later on Saturday we drove into the town of El Centro. Seems like a nice area, more than we expected. Walmart, Costco and orther stores about 6 miles. Think I can do most of our grocery shopping at commissary. We plan to return next year for at least a month or more. The Blue Angels winter here from January to mid March and perform at an airshow in March. 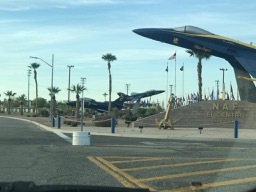 El Centro is in the heart of the Imperial Valley with the main economy being agricuture. Main vegetables grown are different types of lettuce, broccoli, cauliflower, cantaloupes, honeydews, dry onion bulbs,carrots, corn, watermelons, spinach and spring mix. The total economic impact to the community is estimated at 1.5 billion dollars. Hay is also a huge crop with as much as 2 million tons produced annually. It is also home to California's only cheese processing plant. There are more bee keepers in this area per capita than anywhere else in the nation. It is also a huge date growing area. Tomorrow we plan to drive up to the Japanese Internment Camp in Poston, CA 150 miles ow.